GW6604 is a potent and selective ALK-5 inhibitor with potent anticancer activity. Belizatinib is an oral, dual, potent inhibitor of ALK and TRKA, TRKB, and TRKC, with IC50 of 0.7 nM for wild-type recombinant ALK kinase. LDN193189 is a highly potent small molecule BMP inhibitor with IC50 of 5 and 30 nM for ALK2 and ALK3, respectively. 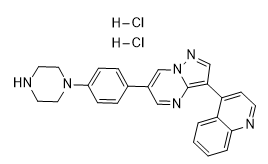 CH5424802 Hydrochloride is a potent, selective, and orally available ALK inhibitor with IC50 of 1.9 nM, the dissociation constant (KD) value for ALK in an ATP-competitive manner is 2.4 nM using a competition-bind assay. ALK inhibitor 1 is a novel and selective inhibitor for the ALK kinase. 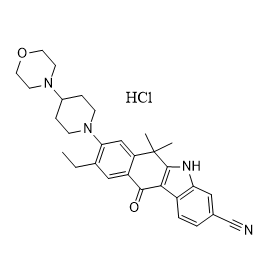 HG-14-10-04 is a potent and specific ALK inhibitor with IC50 of 20 nM.